In the recent past, health literacy has become an important concept in health promotion, disease prevention and disease management. Basically, health literacy refers to the health-related knowledge and abilities that enable a person to use resources and to make healthy choices in everyday life. When considering the health socialisation of children, health literacy has recently regained increasing attention also. Early childhood years and education are known to be valuable for children`s development and future as well as for health and well-being throughout the life course. The early stages seem therefore to be a promising hook to promote health literacy. Parents and caregivers as well as people who work with and for children have a crucial impact on the health promotion and developmental processes of children and adolescents. They act as health socialisation agents as well as surrogate interfaces with child health and other care systems, and therefore contribute to the development of health supportive behaviours and practices. This in turn means that the health literacy of these adult groups needs to be equally included in the discussions about the health literacy of children. From a public health and education point of view, health literacy is a broad and multidimensional concept which is content and context specific. It gains greater depth and meaning in the context of social structures, health inequalities, vulnerability to risk factors and diseases, effectiveness and sustainability of health promoting efforts, and access to, availability of, and quality of health and social care. This is especially important given the socio-cultural and economic diversity of today’s modern societies, the impact of the social determinants of health, and the complex socialisation and education processes on the life course. Research in health literacy, therefore, should be conducted using a multifactorial approach from different perspectives, shoud be culturally sensitive, and should aim at supporting the development of effective programs and interventions for individuals, populations, communities, and the public as well as for organisations. The Health Literacy in Childhood and Adolescence (HLCA) Consortium is a partnership of five German universities that conduct evidence-based health literacy research in ten subprojects for three years from 2015 on. The projects are organised and grouped in three work blocks (WB). WB1 is committed to basic research on health literacy, WB2 is related to mental health literacy, and WB3 to ehealth literacy. While children and adolescent are the primary target population of our research framework, several sub-projects are exploring health literacy in adults and systems affecting children, such as parents, teachers, educators, schools, or social and mental care institutions. Furthermore, the consortium aims at promoting the development, assessment, and evaluation of health literacy interventions for child, adolescent, and adult populations, as well as for health and education professionals. In the second funding period, the HLCA consortium re-news its governance structure. 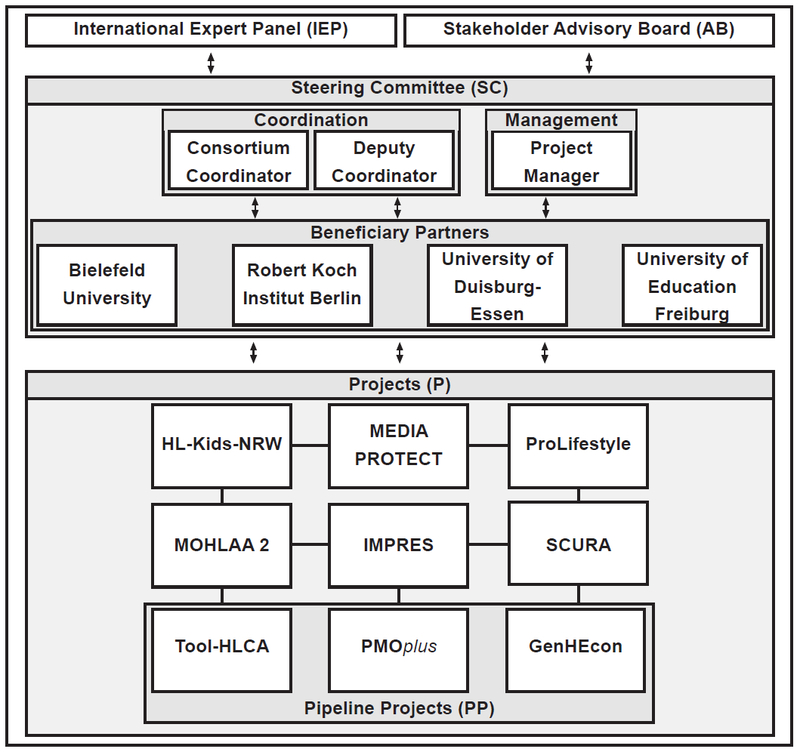 While the consortium will still be coordinated by Bielefeld University, it consists of four partners (Bielefeld University, University of Duisburg-Essen, Robert Koch Institut Berlin, University of Education Freiburg). The management of HLCA will be performed by the project management office, which is located at Bielefeld University. The steering committee will be responsible for the governing of HLCA and will collaborate with a national advisory board (Stakeholder Advisory Board) and an international advisory board (Internationales Expert_innen Panel). Nine projects are addressing the research on health literacy of children and adolescents and thereby focus on different research questions.